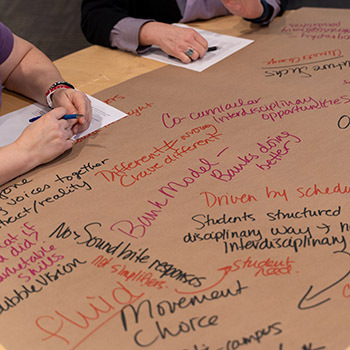 Over the last eight weeks, students, faculty, staff, alumni, and community members have been participating in a range of consultation activities as we gather insights that will help guide Wilfrid Laurier University’s Strategic Plan 2019-2024. The response from our community has been impressive: More than 2,000 people filled out the online questionnaire, including 356 faculty and staff, 632 students and 1,070 alumni and community members. Attendees at the World Cafés held in Brantford and Waterloo were able to delve into questions focused on the “student of the future”. Members of the strategic planning steering committee and resource groups shared information about the strategic planning process at divisional council meetings, Graduate Students’ Association and Students’ Union meetings, and within different units throughout the university. Additionally, we engaged our retirees, management group and senior leaders in consultative exercises before the holiday break in December. Two graduate students, hired as research assistants, are helping us to synthesize all the information gathered. With the support of Institutional Research, the steering committee and working groups have been reviewing internal and external data including enrolment (undergraduate and graduate), Career Services, Human Resources, Research Services, Common University Data Ontario, and student experience (e.g., National Survey of Student Engagement, Canadian Graduate and Professional Student Survey, etc.). These data provide important information related to our current state as well as our position in the sector. Truly, it has been a whirlwind two months. I want to thank everyone who participated in these consultations. Throughout the month of February, the steering committee will be synthesizing your feedback to draft a plan that captures the spirit of Laurier and establishes priorities that reflect the aspirations of our community. In March, the steering committee will share the draft plan with the Laurier community for a second round of consultations. Our goal remains to have the plan approved by the May University Senate and the June Board of Governors meetings.